Anyhoo, there's been a lot of late nights, a lot of knitting, a lot of weaving in of ends, a lot of sewing, a lot of fabric cutting, and a lot of trips to the post office (which is a good thing). There's also a lot of stress going on, but it's all totally self-inflicted. This year is the first year in which the Munchkin is actually excited about Christmas. He's actually interested in helping to decorate the tree and the gingerbread house, singing holidays songs, and getting into the spirit of giving. He's actually excited about Santa and wants to watch all the holiday related cartoons and specials. This year he's been invited to Christmas parties and he even had his very first Christmas concert. It was last night actually, and he got stage fright when he realized the entire room was watching and promptly refused to perform. Poor kiddo. My heart melted at the sight of all the preschoolers in their handmade, construction paper reindeer hats singing Rudolph the Red-nosed Reindeer. Seriously, SO cute! The hats were strips of brown paper with cut-outs of their hands for the antlers. I wanted to squish every single kid. They were that cute! It makes me want to squee at the mere memory. So anyways, I'll stop myself from gushing about the sheer cuteness of the preschoolers' rendition of 'I Want a Hippopotamus for Christmas' and say that all these points kind of make me feel like I need to go all out this year to make it an overly awesome and memorable holiday season. Since who knows, maybe this Christmas will be the first Christmas he'll remember the most about his kidlet days? So much pressure, right? Definitely self-induced. I'm totally vowing to go easy on the crafting front in January. Mark my words. For now though, I've got stockings that need to be knit up, gifts that need to be wrapped or packaged up, a few gifts still need to be purchased (I'm totally avoiding all shopping centers, not a good thing when you need to buy stuff), and a handful of "appreciation" tokens to be sewn up. All of which are time consuming and time isn't something that I have a lot of at the moment (after all, Christmas is only a little over a week away!). So if you need me, I'll be in a corner somewhere in my house frantically trying to knit/sew/wrap/keep sane. A note to the wise: I wouldn't come too close until after the holidays. Unless you approach slowly and baring gifts of coffee, food, or yarn! What is the colourway for the the awesome sock on the left? Christmas sounds perfect when there is a child involved :) and much luck on getting everything done. Oops, sorry Sunny for replying so late! The sock on the left is actually a Christmas stocking for my little one! I used Knit PIcks Brava Worsted in Dove Heather, Peapod, Tidepool, and Sienna. 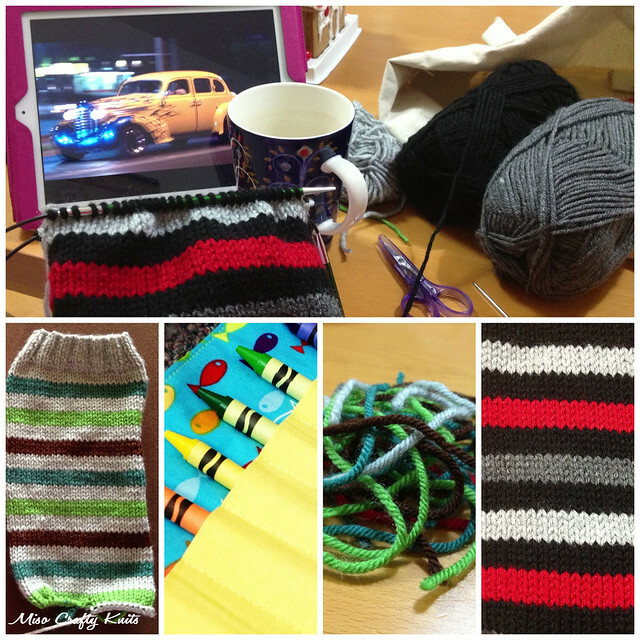 The pattern is from the Purl Bee blog, it's super easy and when knit on exclusively, knits up relatively fast. Merry Christmas Melissa! Thanks for the reply and that is such a freakin cute idea for a Christmas stocking. So simple and fun (color as well) but one that I would not have thought of.